This week, commentsfrom guest blogger and International Space Station Principal Investigator Dr.Mark Weislogel, as he reflects on the importance, advantages and joys oflong-duration investigations on the space station. Scientists who have not used the International Space Stationbefore don’t always have a feel for how space experiments can be as successful,if not more so than those using other low-g environments. Researchers used tothe shuttle experience think in terms of a very small window of time to makechanges and adapt. Short duration investigations are intense and competitive.In hindsight, it seems they are high risk. If you have a three-hour slot to runyour experiment and some setback occurs that cannot be resolved, you lose aportion of your data. On the space station this can also happen, but when youengage in long-duration investigations, you quickly realize that you have timeto think things over. Because of this, when unexpected events occur, you canrespond in a creative and curious way. The success factor of long-durationexperiments is high—barring any failures in equipment, a risk in any lab. Infact, you are very likely to discover things you would not anticipate; thingscompletely peripheral to the goal, which you will observe for the first time,due to man’s limited experience in microgravity. 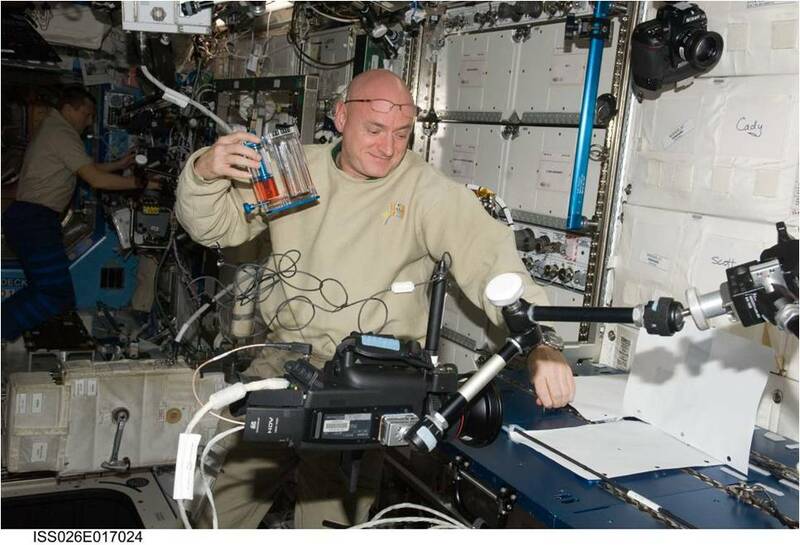 NASA astronaut ScottKelly, Expedition 26 commander, works on the hardware setup for a CapillaryFlow Experiment (CFE) Vane Gap-1 experiment. The CFE is positioned on theMaintenance Work Area in the Destiny laboratory of the International SpaceStation. 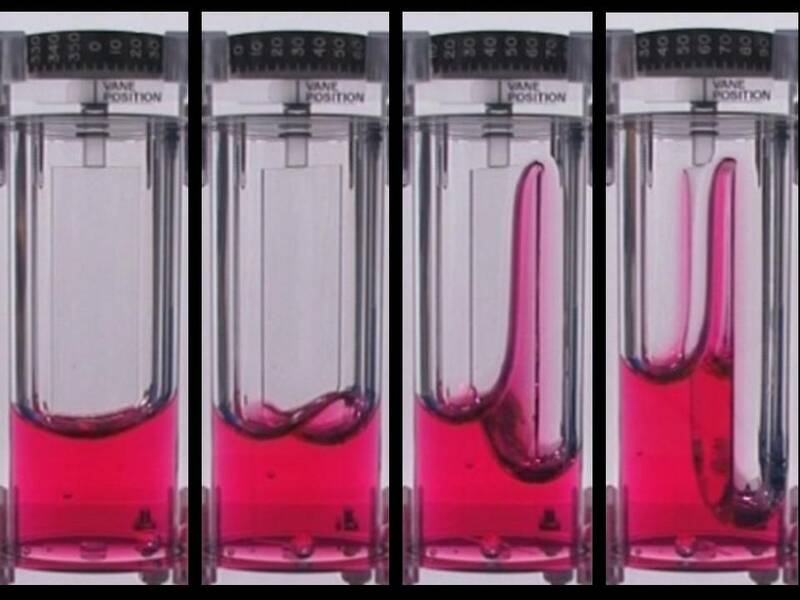 CFE observes the flow of fluid, in particular capillary phenomena, inmicrogravity. Transitions in fluid locations due to slight changes incontainer geometry. As a central vane is rotated in this elliptic cylindercontainer critical wetting geometries are established leading to wicking alongthe vane-wall gap, and/or a bulk shift of fluid from right to left. Time and resources factor into any discovery, of course, andsignificant astronautinvolvement makes a big difference, too; certainly more so than inautomated or robotic investigations. But even with the CapillaryChannel Flow or CCF investigation that I am working on right now, it is amazing! If you have a pump and some valves, you can configure them in many ways you did not anticipate and widen your data set. You want to get what you planned on, but it is a delight to get all this extra information that you never expected! My previous experience dealt with handheld, smallexperiments, so to me CCF is a complicated investigation. 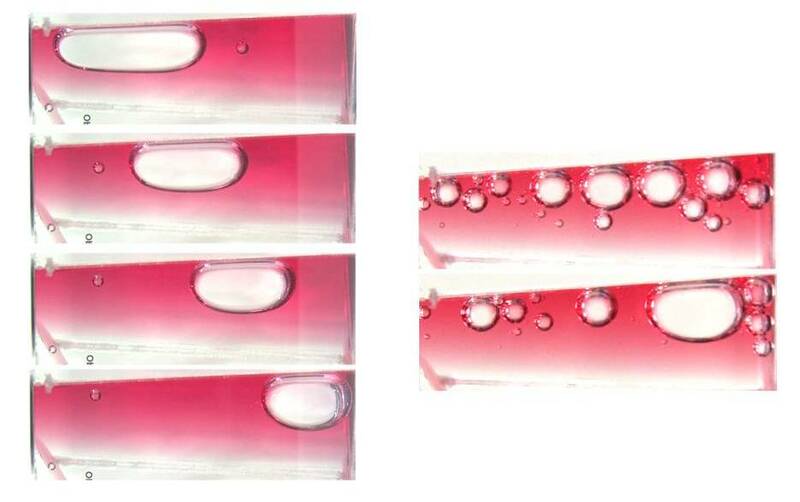 CCF is focused ontwo-phase flow—a liquid system with gas bubbles. In space, the gas does notrise and we have not had many opportunities to study systems like this inmicrogravity. The investigation has pumps and valves and plungers andseparation chambers. While there are other studies devoted only to two-phaseflow, CCF has two-phase flow all throughout it just to generate the flow thatwe are interested in watching. CCF operates continuously, controlled from theground through the Microgravity Science Glovebox or MSG interface and does notrequire crew interaction. We have gotten to the point with CCF where we can get around20 data points per day and we are on our way to where we can get hundreds andhundreds of data points in a 24/7 operation. The system is working, thoughthere are setbacks—often times with loss of signal during our commanding or dueto our own thing—in trying to take inventories of where the fluids and gasesare in the system. We are regularly downloading high resolution, high speedimages and plotting them right alongside of our analysis on the ground andseeing new things there, too. The 24/7 collection is exhausting, but we know wecan do it! In the image above, single and multi-bubble migration and phaseseparation are driven passively by specific control of container shape. A taper ina polygonal sectioned conduit leads to capillary pumping of liquid from rightto left driving bubble left to right. Such mechanisms may be invoked by fluidsystems aboard spacecraft to separate and store fluids by phase without movingparts. On the ground, the joint German-US team started with 24/7 operationsto learn the experiment in the first 2 to 3 weeks. Then the team travelled toGermany and slowed the pace, learned the system, then ramped up again to 24/7operations. [Development and ground operations for CCF take place at the GermanAerospace Center, headquartered in Cologne, Germany.] Our operations are muchmore controlled than before, because we were working 16-hour days to supportthat. The team then continued running for a few weeks until we finished ourfirst set of objectives. Unexpected developments are part of the joy in microgravityinvestigations. When you make a discovery, you think, “Oh my, of course thisshould happen!” But no one has seen it before, because no one has had this nicelow-g environment for such a long duration. This is fun because it kindles the samekind of excitement that you have in your lab when you are definitelydiscovering something. It’s very exciting! The thing is that the chances for discovery are much higherwith long-duration investigations on the space station. This is because we do notlive in that environment. You may be trying to verify a theory—and that isgreat—but en route you are very likely to see things to compliment orsupplement your investigation and even take you in different directions. Youwon’t have thought of these discoveries until you actually see them. That’swhat it is like with fluids in microgravity, as well as with combustion, materialsscience, and other fields. One thing I feel very good about is that most of myinvestigation results can apply in the real world right away. Our work hasalready led to design concepts to improve the performance and reliability ofadvanced systems, such as condensing heat exchangers and waste-water treatmentdevices. It can also help with liquid fuel tank and fuel transfer designs. Theresults give new insight, confirm theories, and are useful for space and groundresearch. So there is not always a long lead time between the science productsand their use. This generates a good feeling, seeing that there is contributionin an observable timescale. This is not common in science and usually takesdecades to realize. Instead, these results can improve design and space systemdesign right now. Dr. Mark Weislogel isa professor in the Thermal and Fluid Sciences Group in the Maseeh College ofEngineering and Computer Science at Portland State University. He has researchexperience from government and private institutions. While employed by NASA, heproposed and conducted experiments relating to microgravity fluid mechanics.This unique subtopic area within fluid mechanics provides significantchallenges for designers of fluids management systems for aerospaceapplications. Weislogel continues to make extensive use of NASA ground-basedlow-gravity facilities and has completed experiments via space shuttle, theRussian Mir Space Station, and the International Space Station. While in theprivate sector, Weislogel served as principal investigator for applied researchprojects concerning high-performance heat transport systems,micrometeorite-safe space-based radiators, microscale cooling systems,emergency oxygen supply systems, and astronaut sleep stations. His current researchincludes passive non-capillary cooling cycles for satellite thermal control andcapillary fluidics at both micro- and macro length scales. Weislogel has writtenover 50 publications; see http://web.cecs.pdx.edu/~mmw/for further details. It’s amazing how these Nasa engineers can calculate everything so precise to the most intricate measurements for evey aspect of there work. I wonder if nasa engineers use home solar panels in there homes, because it makes sense for engineers to live green.